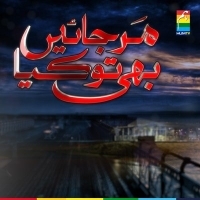 Mar Jain Bhi To Kya is a Hum tv soap starring Farhan Ali Agha, Jibran, Eshita, Kunwar Nafees, Jana Malik, Areej, Asma Jahangir and Anum Fayyaz, the serial is directed by Saif-e-Hassan and Co.Director Adeel Qamar Khan and written by Iqbal Bano. Malik Raza Ali Gillani is a very affluent man whose younger sister Sameena studies in the city and likes Irfan. Raza is in love with his cousin Saeeda but on the insistence of Sameena he sacrifices his love and gets married to Irfan’s sister, Saleha. Raza is unable to give Saleha the love and attention she deserves as his wife. Things take a turn for the worse when Sameena starts to regret marrying Irfan. Will Samina save her marriage? Will Raza ever be able to make Saleha happy? On this page: Mar Jain Bhi To kya story, synopsis, wiki and details about the tv show.